In the previous post, we have seen different types of wait commands in Selenium. 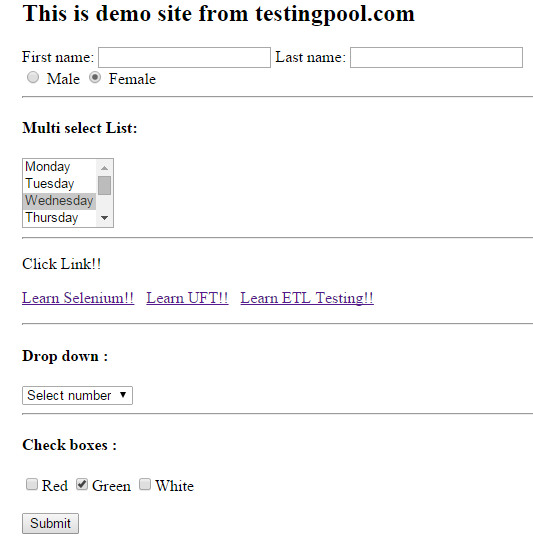 In this post, we will see how to work with WebList in selenium. If you are automation any web application, you might have to handle WebList or say drop downs in some of the scenarios. In WebList, You can perform actions like select, deselect , randomly select and many more on the values available in to that. We will see how to perform these action. Important note: We have create a demo application for working with elements like weblist,checkboxes,radio button ,links etc. Click Demo Application to access it. It will look like as shown below. Let’s understand different operation on weblist with examples. For performing operations on WebList, we use the Select class in selenium. We will look into some useful methods. Example of selectByVisibleText(): This method select the value in drop down by using the visible text. In our application, we have one drop down where we can select the numbers. In the code below, we are selecting number 4. Output: No. 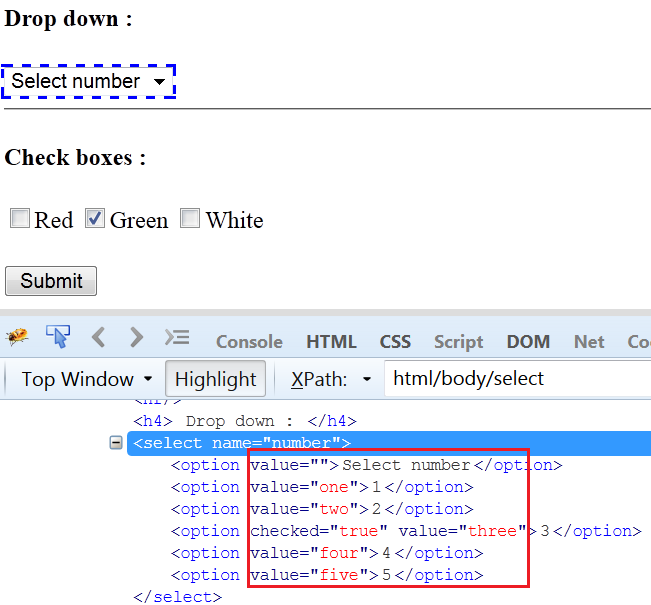 4 is selected in drop down. Example of selectByIndex(): This is used to select the item on the basis of index. Index starts from 0. If there are 5 values in the drop down, they will be accessible at the index 0,1,2,3,4 respectively. In our code , we have given the index 1. Index 0 has value ‘Select number’, index 1 has value 1, index value 2 has value 2 and so on. Output: No. 2 is selected in drop down. 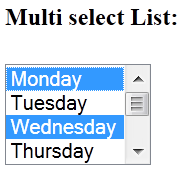 We have one more type of list in the application where we can select multiple values.The default value selected in this is ‘Wednesday’. If we select index 0 , then let’s see the result. Output: Monday is also selected in list with Wednesday which was by default selected. 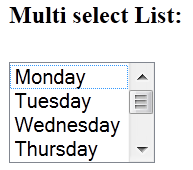 Example of selectByValue(): It is one more way to select the list item on the basis of list values. You can check the list value with the help of Firebug. Suppose, we need to select the number 5, then its value is “five” as shown in the above screen. Output: Number 5 will be selected. 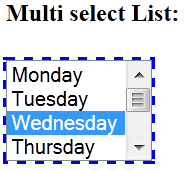 Example of deselectByVisibleText(): In the multiselect list, we can see ‘Wednesday’ is by default selected. What if we want to deselect it? It can be possible by using method deselectByVisibleText(). Output: It will deselect Wednesday. Similar way , we have more methods for deselecting. deselectAll(): It will deselect all the selected values in the list. deselectByIndex(index) : It will deselect on the basis of index as we have done with selectByIndex. deselectByValue(String value): It will deselect the list item on the basis of Value of the list. How to read all values of a webList? We can read all the values in a weblist by using method getOptions(). This method will return the List of webelements and then in a for loop we can read the text property of all the webelements.